Montreal’s STM Transit System an Ideal Way to Get Around the City – Peninsula Moves! From June 11 to June 18, I attended the American Public Transportation Association’s (APTA) Early Career Program and its annual Rail Conference in Montreal. The Early Career Program offers transportation industry employees an opportunity to receive mentoring from transit veterans from across the country while networking with other young(ish) professionals in the industry. The initiative also provided me with a chance to explore Montreal, an extremely cool city that is served by the Société de transport de Montréal (STM), one of North America’s most successful transit systems. The STM, comprised of a bus and underground rail network, carries 2.5 million passenger trips a day, making it the fourth-busiest public transportation provider on the continent. Despite the huge passenger loads, the STM regularly receives annual customer satisfaction ratings above 80 percent. On Sunday, June 15, following one of APTA’s rail subcommittee meetings, in which Caltrain representatives made a presentation on our rapidly growing ridership numbers, I set out to travel around Montreal using the STM’s impressive system. Since Sunday marked the first sunny day I’d seen in Montreal after long periods of rain, I decided to visit a small beach on the St. Lawrence River that I’d read about called the Parc Jean Drapeau. 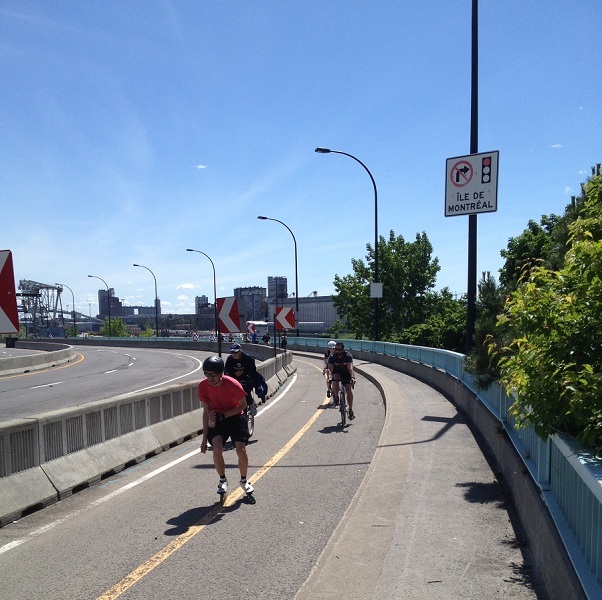 Cyclists enjoy the bike path across the St. Lawrence River. I was staying at the Le Centre Sheraton on Rene Levesque Boulevard in Downtown Montreal, and the beach is located on a small island on the St. Lawrence River, which surrounds the city. I started my trip by hopping on the Green Line, which is part of STM’s underground Metro service. The Metro has four different lines serving 68 stations throughout the city, and daily ridership on the system is 1.3 million, making it the third-busiest subway in North America. The entire network is underground, and, on an interesting note, the trams all have rubber tires, a design based upon the Paris Metro. As an attendee of the APTA Rail Conference, I was given a three-day pass on the STM’s OPUS card, an electronic fare media that is similar to the Bay Area’s Clipper card. I scanned my OPUS card at the entrance to the Green Line’s Peel Station, and after waiting for a few moments, hopped on a busy train car in the direction of the Honore-Beaugrand Station. After a five-minute ride, I disembarked at the Berri-Uqam Station and transferred onto the Yellow Line, a short, but heavily-traveled route that caters mostly to college students at the Université de Sherbrooke. Riders on Montreal’s STM Yellow Line. 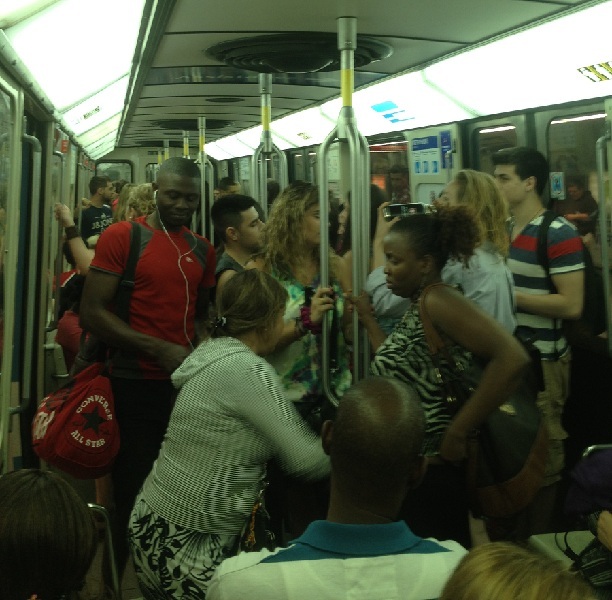 Since there was an electronic music festival on the same island as the Parc Jean Drapeau beach, the Yellow Line was extremely crowded, but I never felt uncomfortable or uneasy, and everyone on the train seemed accustomed to riding in close quarters. After a quick journey aboard the train, I exited at the Jean Drapeau Station and walked back up to street level. Along with a robust transit system, Montreal is outfitted with a highly-developed bike and pedestrian network, a design that reflects the city’s European roots. On my way to catch a local bus to the beach, I passed by several cyclists and pedestrians, all travelling along dedicated pathways. The city also has a bike-sharing program similar to Bay Area Bike Share and cyclists could be seen throughout Montreal, integrating seamlessly with automobiles. Although the water was a bit chilly, it felt great to lounge on the beach after enduring several torrential downpours earlier in the week. Overall, the trip from my hotel to the beach took only about an hour, but the seclusion of the location made it feel like we were hundreds of miles from the hustle and bustle of downtown Montreal.